This is an archive of my original review of Vista Beta 2. The new setup pages will show you the final version in action, and help you get started using Chinese in Vista. I am preserving this review because it covers a few details I did not concentrate on elsewhere for a while, including handwriting, speech, and IDN. 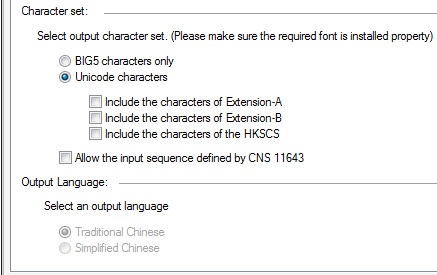 Windows Vista includes Chinese input methods and fonts. Installation is very similar to Windows XP, except that you don't need to activate your East Asian fonts first. This is a review of Beta 2, released in mid-2006. [Update: click here for the final setup pages.] Before you try anything, please let me advise you not to install Beta 2 as an upgrade to your existing Windows XP system. Vista Beta 2 is not entirely stable, it may not be upgradable to the final Vista release, and it is certainly not worth the risk. Use a new partition, a separate disk or an entirely different PC. Please. For more info on overall Vista installation, there are better resources than Pinyin Zhou. Once you get to the Chinese setup, feel free to contact me for help. 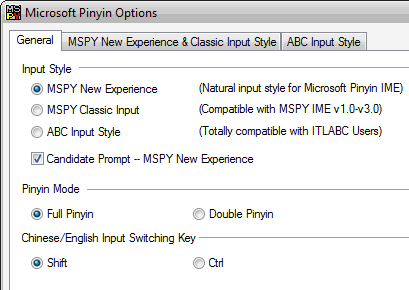 The simplified Microsoft Pinyin IME, co-developed by Microsoft and the Harbin Institute of Technology since 1996, now includes a new input style called "MSPY New Experience", a "natural input style" that starts suggesting candidate Chinese characters as you type each letter. In contrast, the old MSPY Classic Input style waits for you to finish each Pinyin sound before offering candidates. I'm sure I've seen this natural style in third-party IM packages before. I believe these OpenType fonts include expanded (GB18030) character sets and offer the general advantages of being ClearType fonts. The original "SimHei" traditional/simplified heiti font that was included with Windows XP is still in Windows Vista as well, so your old documents won't lose their original font. These new fonts look pretty good to me, but (Hello, Microsoft?) hei fonts are headline fonts and are not the fonts we work in every day for the bulk of our text. How about an improved song or a kai font first? I understand the final release will also include new bit-mapped fonts to take us part of the way there: DF Kai-SB and another KaiTi as well. Vista's font menu includes new "Extension B" fonts next to updated versions of their XP-era parents, plus two new fonts that comply with the Hong Kong HKSCS standard, one basic and one "Extension B". It will also be possible to obtain minority language fonts like "Yi Baiti" from Microsoft. I am currently gathering more information about these fonts. I look forward to hearing from anyone with additional information on these font updates, and I will share what I find out here on this page. The Vista Enterprise and Ultimate packages will include all 36 available multilingual user interface (MUI) packages, to be known as Language Packs. That means the top-end enterprise and home versions will have this available. The files necessary to set this up are not included with the public Beta 2. If you try to set this up the system will ask you where the files are, and of course you won't have any. If you want to learn more about MUIs while awaiting the final release, please see my description of the XP Chinese MUIs elsewhere on this site. Most visitors to this site type Chinese with Pinyin input methods far faster than we could ever enter characters by hand, but for normal Chinese people and other occasional users handwriting recognition would really be the only solution...if it worked. Microsoft has taken another step in this direction by adding more artificial intelligence to learn your unique handwriting. It will remember the corrections you make so that it can make a better guess next time. I do not plan to test this feature, being Pinyin Joe after all. But I believe you should not begin using the handwriting feature with high expectations, at least initially. The Microsoft folks know this is a work-in-progress: they have added a "Send to Microsoft" error reporting feature to this component, similar to the automated crash reporting in the overall operating system, so you can help them make improvements. Speech recognition is another work-in-progress for many many years now. 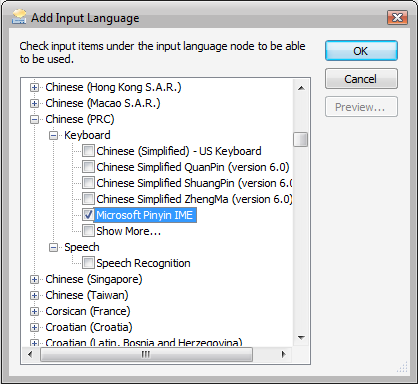 Vista Beta 2 does not appear to include the Chinese speech input feature, even though I found Speech Recognition listed under the Chinese IMs and was able to select it. When I click on the Properties for that item I get a message telling me it is not there. However, this is a sign that the final Vista release will include many more included speech features than XP. Microsoft has announced that the final Vista release will include speech recognition incorporating the latest developments, but only time will tell if these improvements will include Chinese on the final disk. Effective speech input would be a sci-fi dream come true, if it ever works (and if you had a place to use it without driving the people around you crazy). Speech synthesis, or Text-to-Speech, continues to improve and I'm told the Chinese voice to be included with Vista, "Microsoft Lili", sounds very nice in both Chinese and English. Unfortunately the US Vista Beta 2 only ships with the new Microsoft Anna, a US English voice and engine, and I do not know what will be included with the final Vista release. Microsoft Anna sounds a bit clipped and unnatural to me. Contrary to some rumors, Microsoft Lili's voice is based on recordings of a professional news announcer in Beijing and not on the voice of the lady you will find via most search engine results for "Microsoft Lili": NYU grad and visionary Director of User Experience and Research at Microsoft, Lili Cheng. If and when you get ahold of the Lili synthesized voice, I'll let you decide: from this C|Net page you will find a video interview with Lili Cheng (requires QuickTime). Internet Explorer 7 includes international domain name (IDN) support, also known as "native language web addresses". This is the ability to enter and display Web urls in many languages. Opera, Mozilla Firefox and Mozilla Navigator already have this. At this stage of the game, there are many compelling security reasons to turn this feature off. With IDN you can type urls in the address bar using Unicode-based character sets, and the domain is supposed to resolve to the correct IP address. For those of us who surf around to many multilingual sites, this is interesting stuff. When the Chinese Domain Name Consortium makes Chinese character domains are available, IE7 will be ready. Maybe. IE7 includes security features that will (attempt to) protect us from "phishing" spoofs of domain names using multilingual characters, but I will not go into that here. Wikipedia has a good article on International Domain Names covering issues like punycode, phishing, and other phat phun. My first impressions? Vista sure is pretty. Lots of bells-and-whistles. But I see nothing that is truly innovative in the area of multilingual computing. I'm sure IDN was not trivial to implement, and is a big deal to many Chinese users, businesses and politicians for many reasons. Similarly, the inclusion of Unicode and simplified characters in the traditional IME reflects serious political and economic accommodations in Taiwan, and these changes are no small thing to many people there. But from the perspective of the average multilingual user I find very little to get excited about. All the other changes to Chinese features in Windows Vista may have been hard work, but to this user the results are just incremental improvements over Windows XP. I am still hoping for new revelations from Microsoft that there really are exciting new innovations in Chinese computing hidden inside. If anyone would care to enlighten me, please let me know and I'll post it here with my thanks.